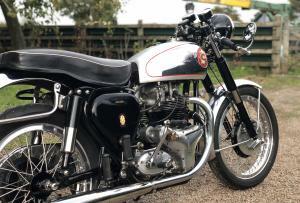 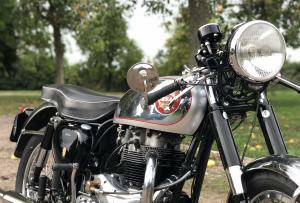 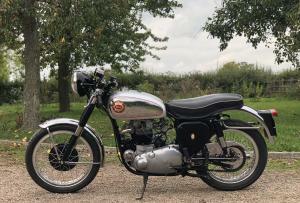 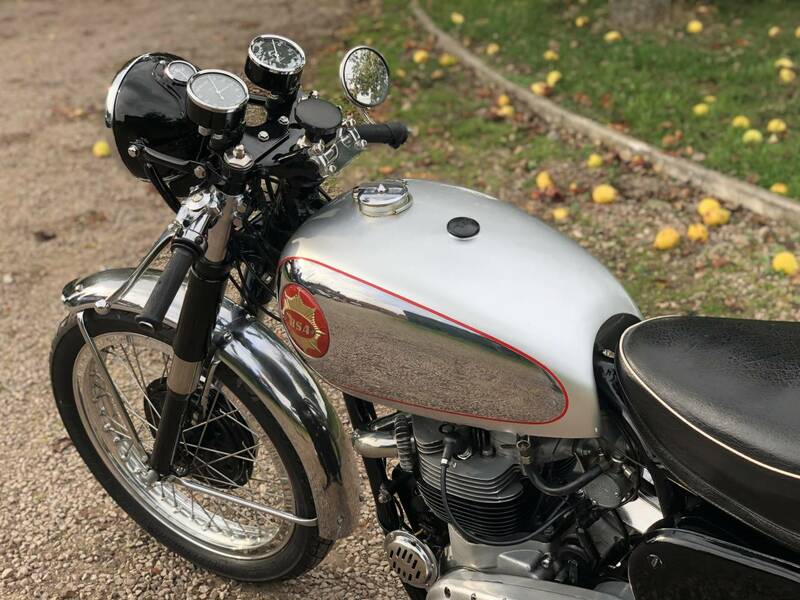 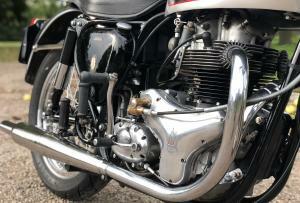 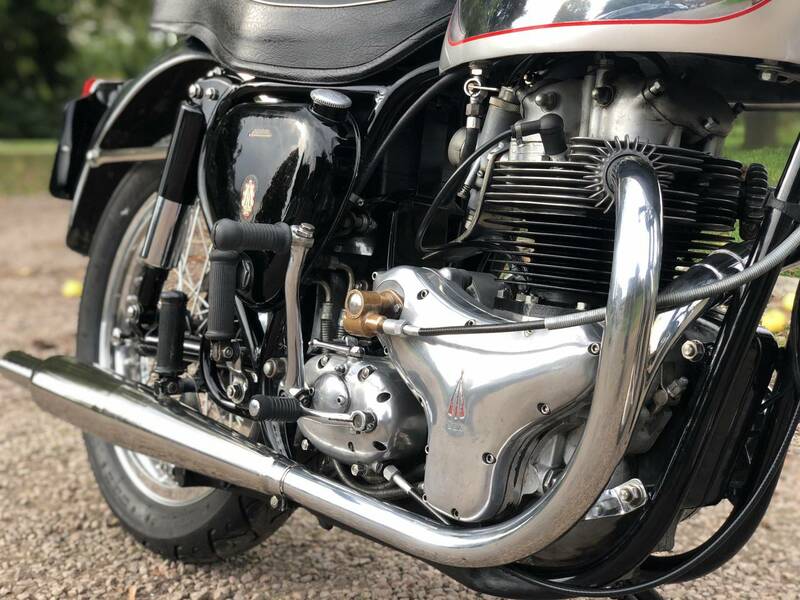 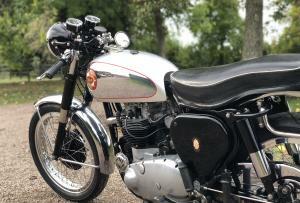 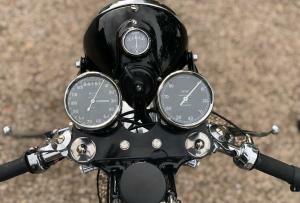 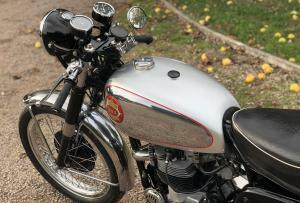 BSA Rocket Gold Star Replica 1955 650cc . 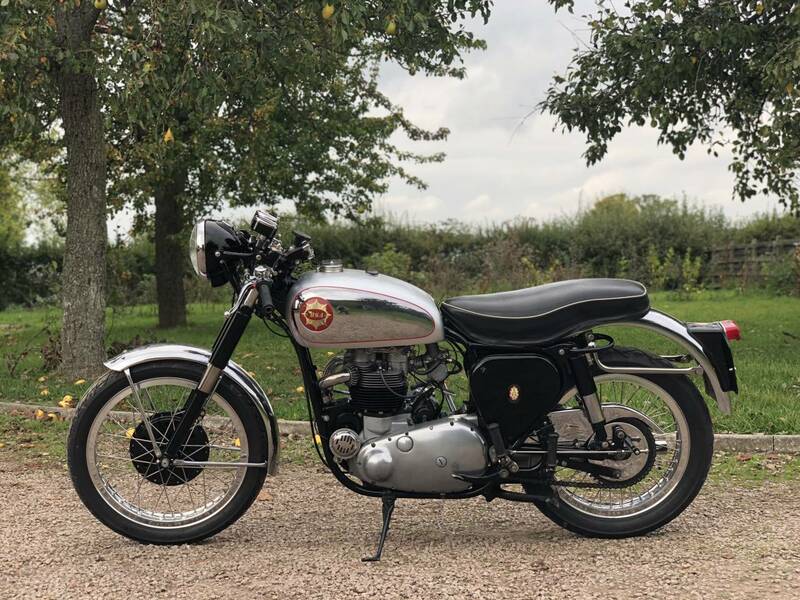 This Is A Superb Copy Of An RGS , With A Genuine DBD ; CB32 Duplex Frame & Gold Star Owners Club Authentication Certificate ! 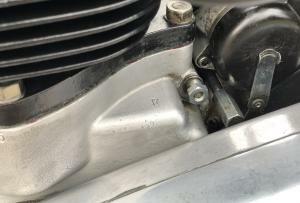 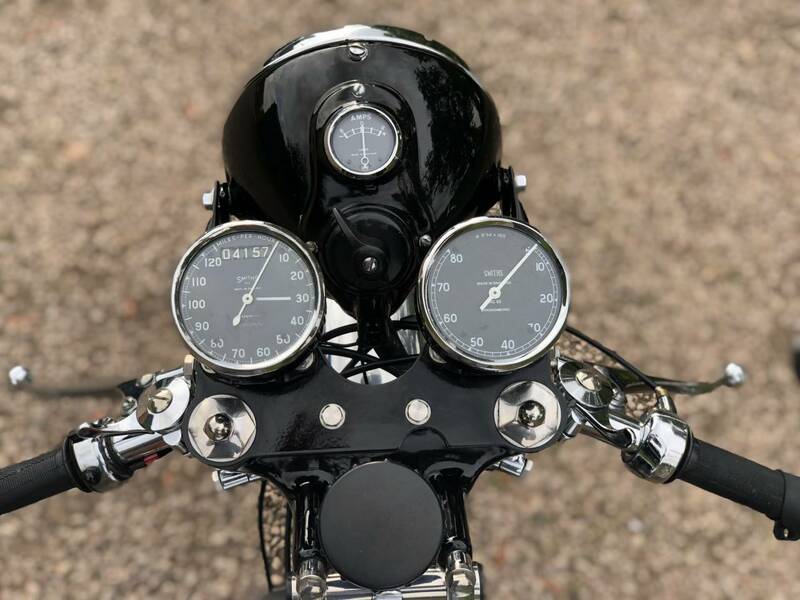 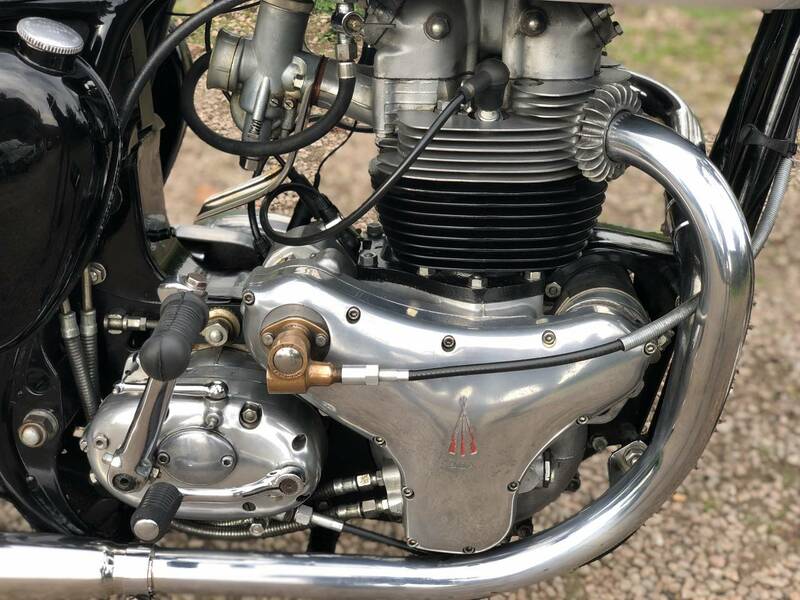 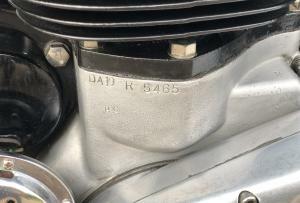 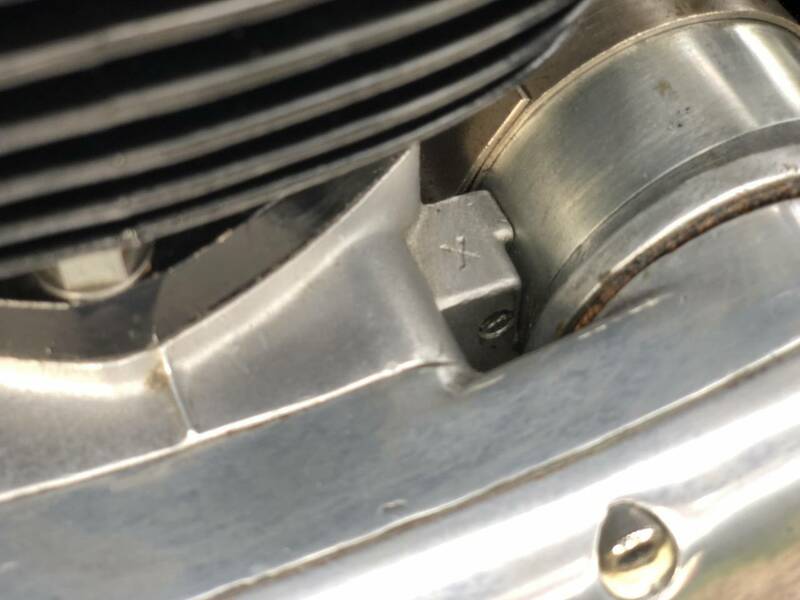 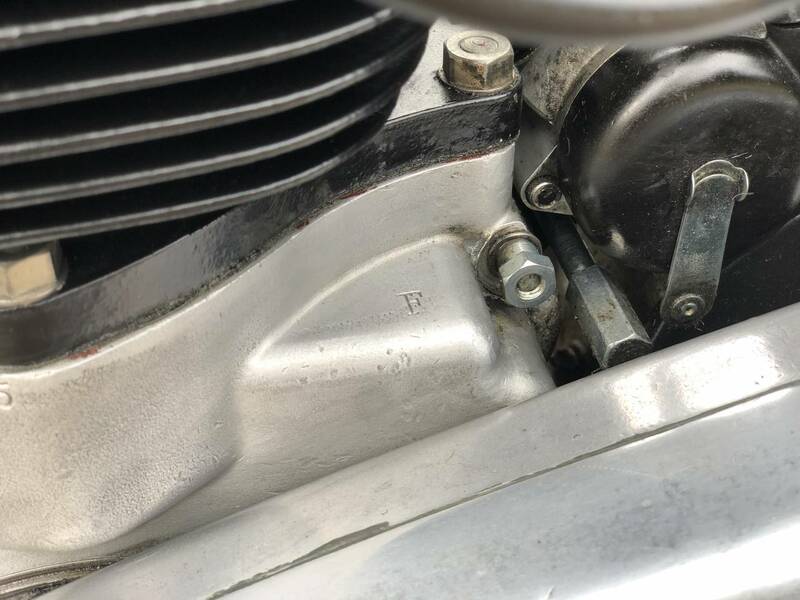 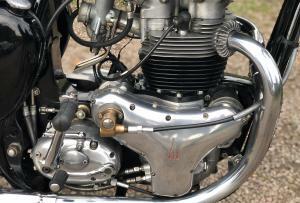 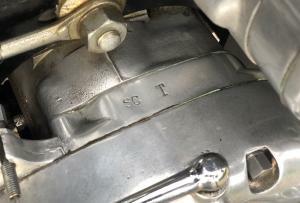 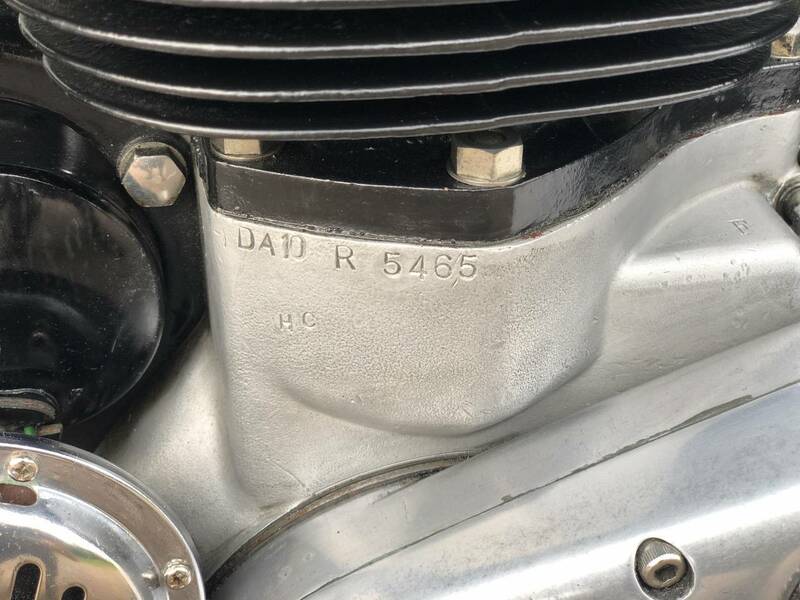 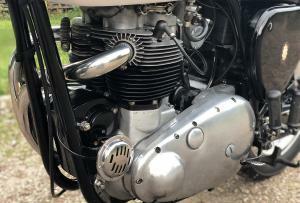 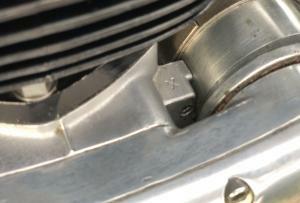 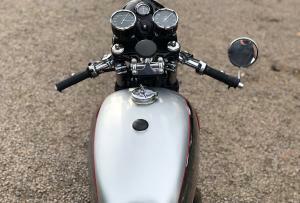 Genuine , DA10 R Rocket Engine ; With Alley Head & Brass Rev Counter Drive , The Whole Machine Has Been Totally 100 % Restored , To A Very High Mechanical & Cosmetic Standard , To Include A Spitfire Cam , Etc & Has Lapped The Isle Of Mann & Is Now Nicely Run In , Having Covered 4157 Miles , Without Fault . 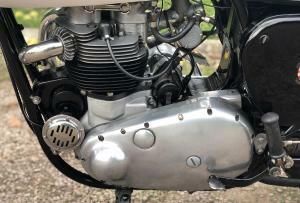 The Whole Machine Has Been Restored , To The Immaculate Condition , You Can See In The Photos & Video. 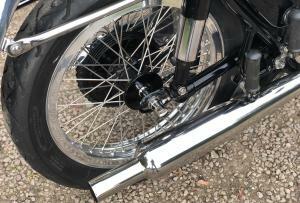 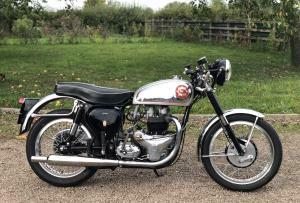 It Has Genuine Polished Alley Flanged Racing Rims , Genuine Goldie , Ribbed Brake Hubs ; ‘ Crinkle ‘ On The Rear , Has Excellent Brakes , Chrome Goldie Mudguards & Stays , Correct Twin Chronometric Rev Counter & Speedo , Anti-rebound Fork Springs , Correct Silver & ‘Thick Chrome ‘ Genuine UK Goldie Petrol Tank With Breather , Full Goldie Exhaust System & Goldie ‘ Twitter ‘ Silencer , Rare & Very Valuable & Sought After ‘ SC T ‘ Gearbox , Manuel Advance & Retard Magneto , Etc , Etc . 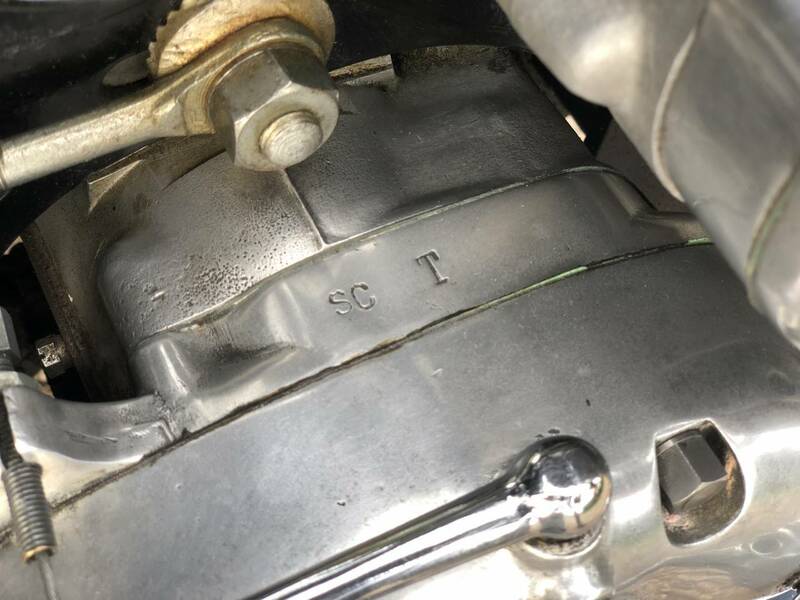 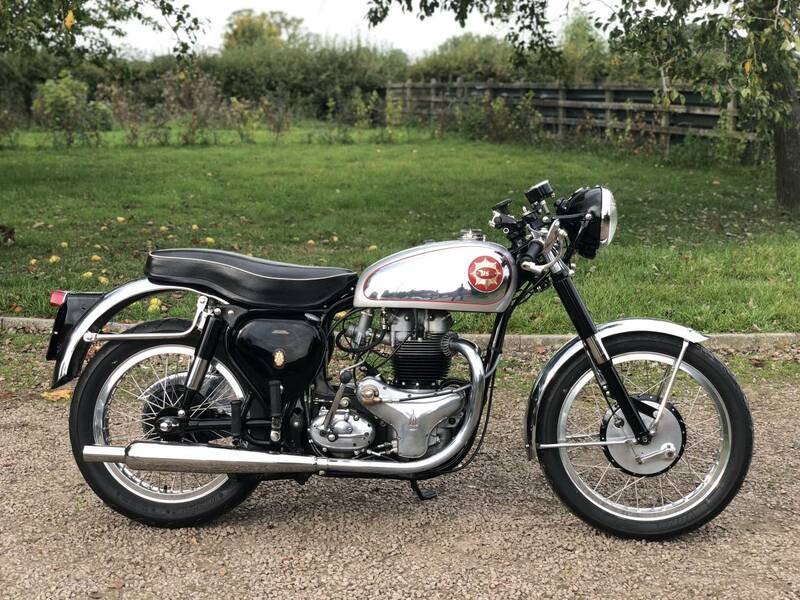 Starts First Kick & Ticks Over Immediately , With A Wonderful Exhaust Note & Revs Freely & Quickly , With An Exceptionally Mechanically Quiet , But Very Strong Motor. 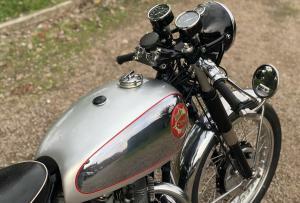 This Is A Real ‘ Flying Machine ‘ & At Least As Quick As The Real Mc Coy & May Be Quicker ! 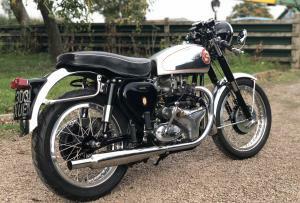 It’s Been Totally Reliable , In It’s Elderly Owners 11 Year Custody & Has Lapped ‘ The Island ‘ Many Times & At 90 mph ++ ! 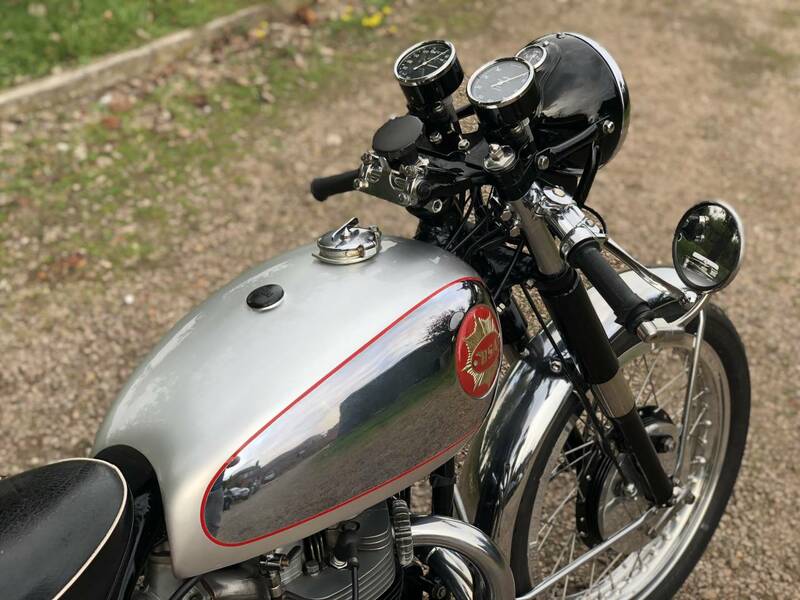 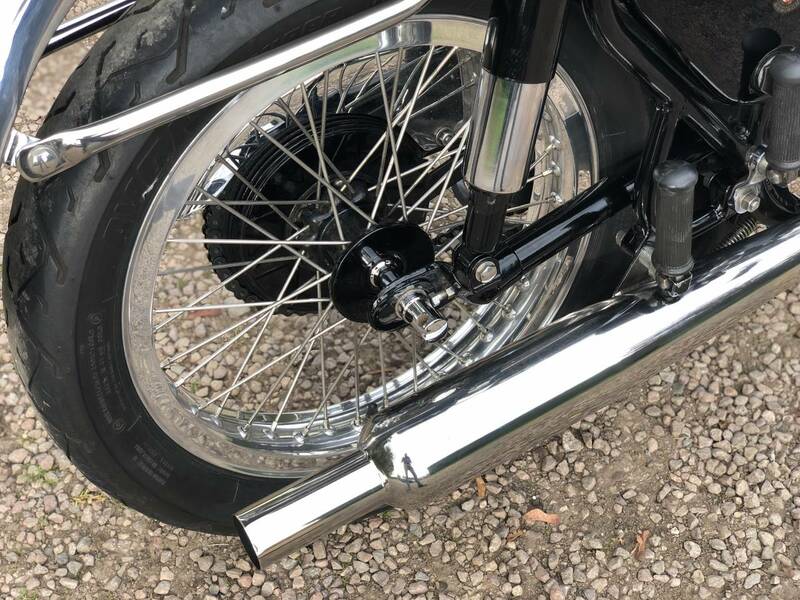 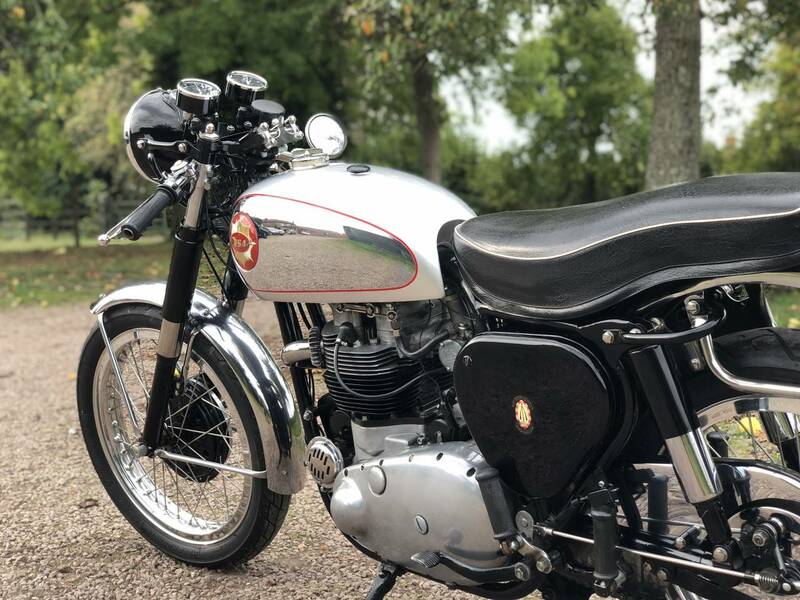 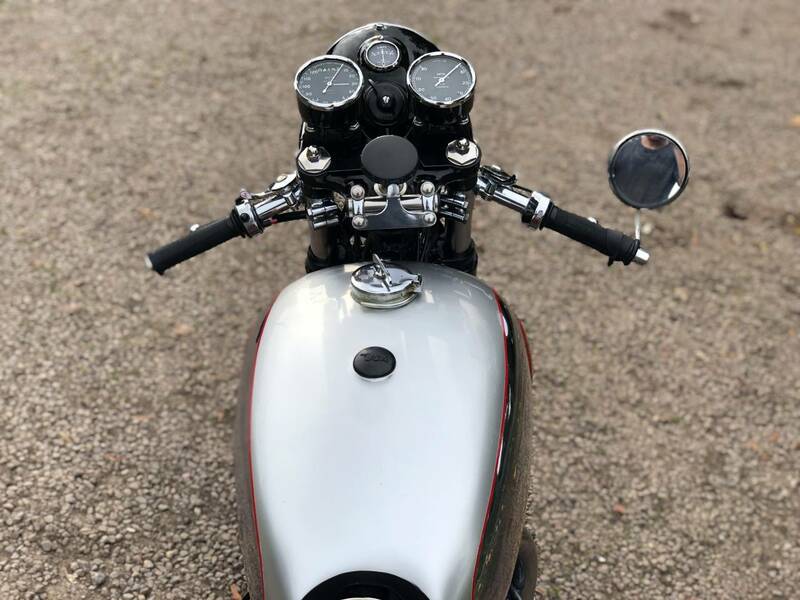 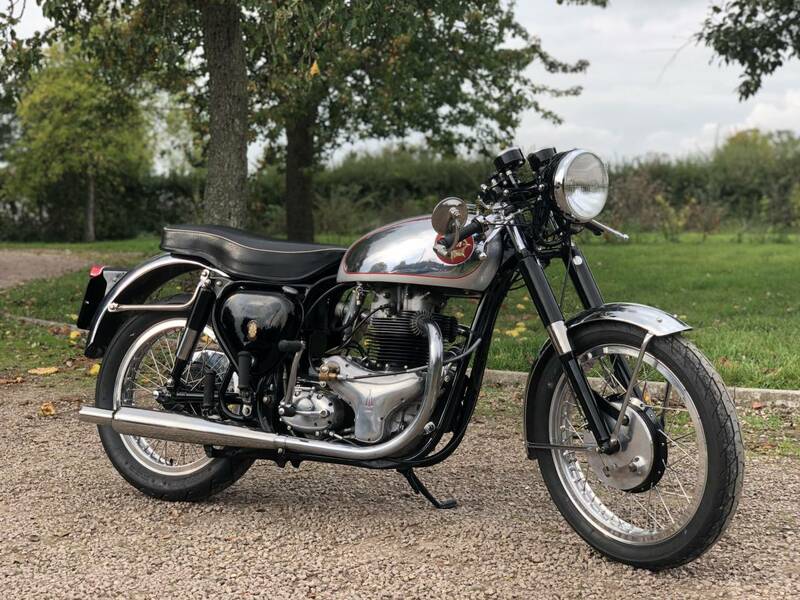 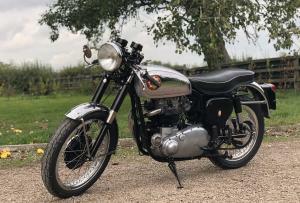 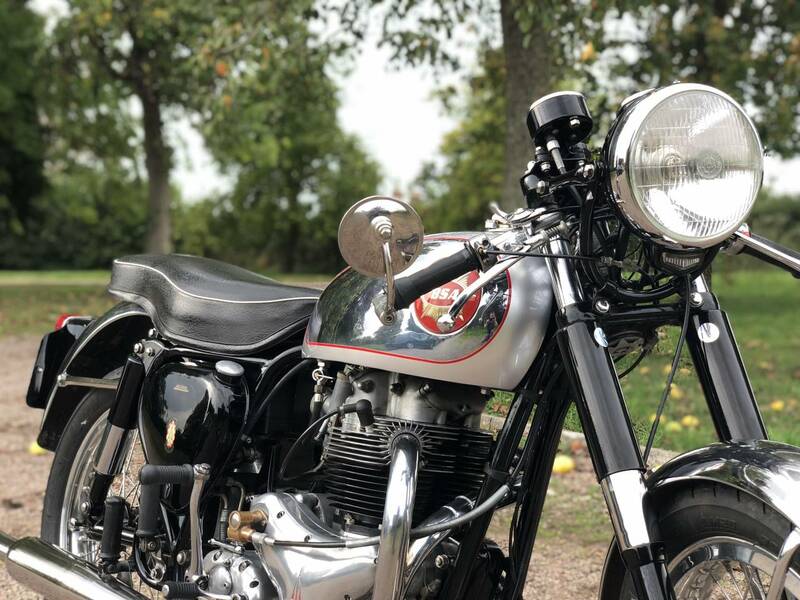 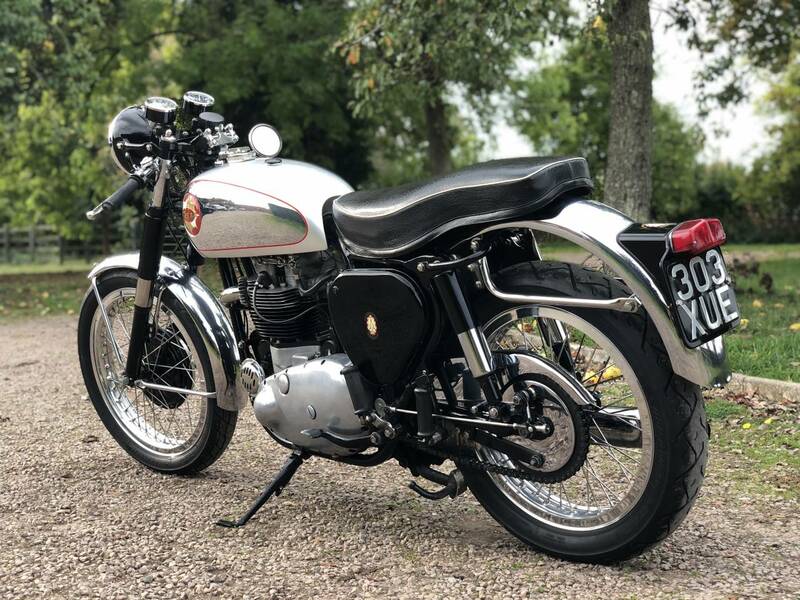 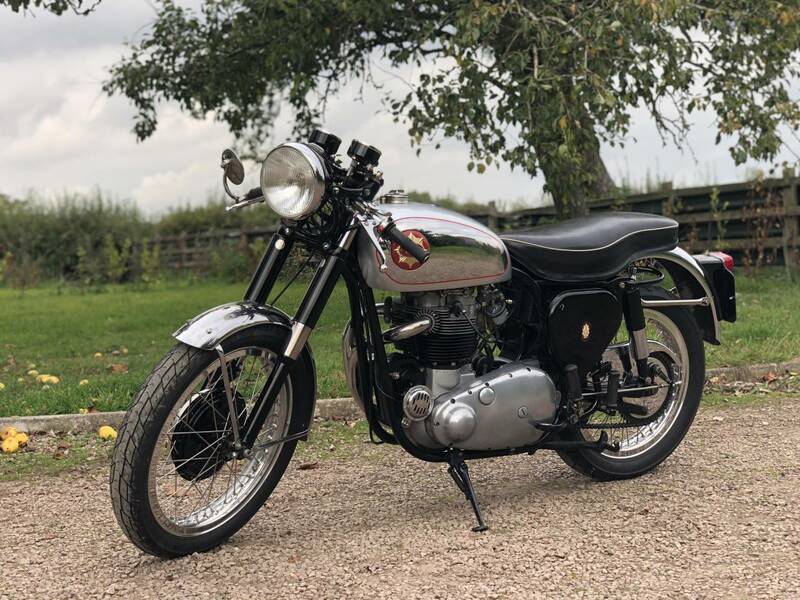 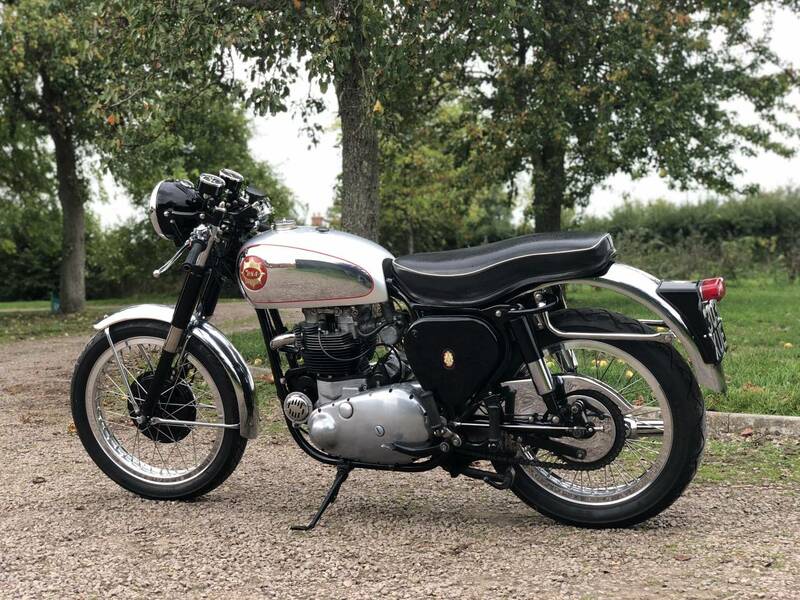 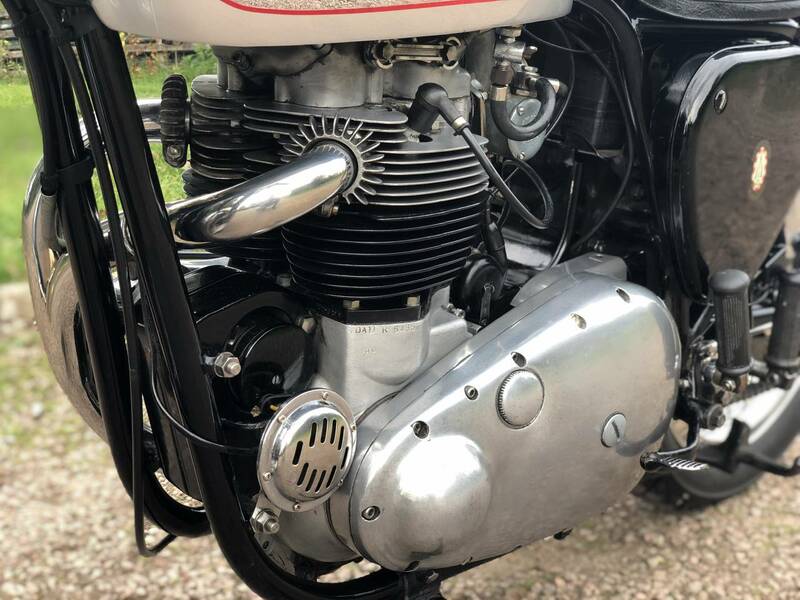 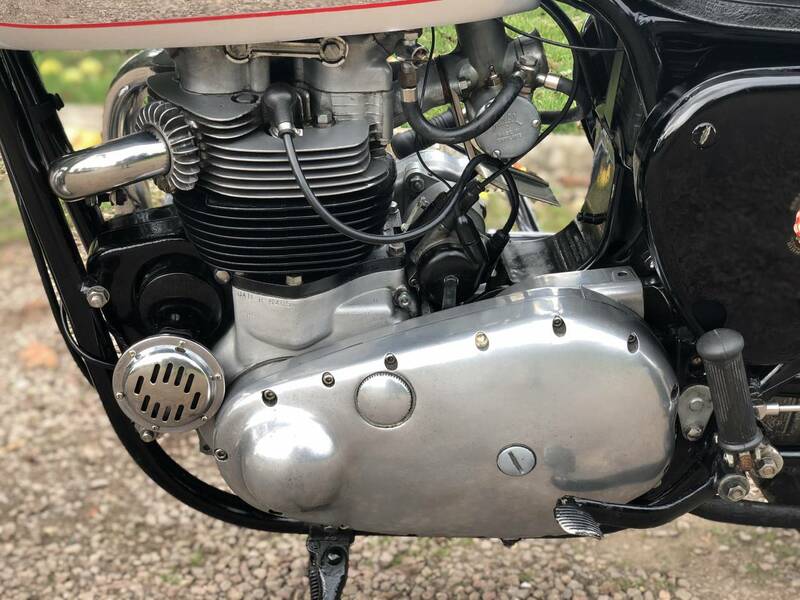 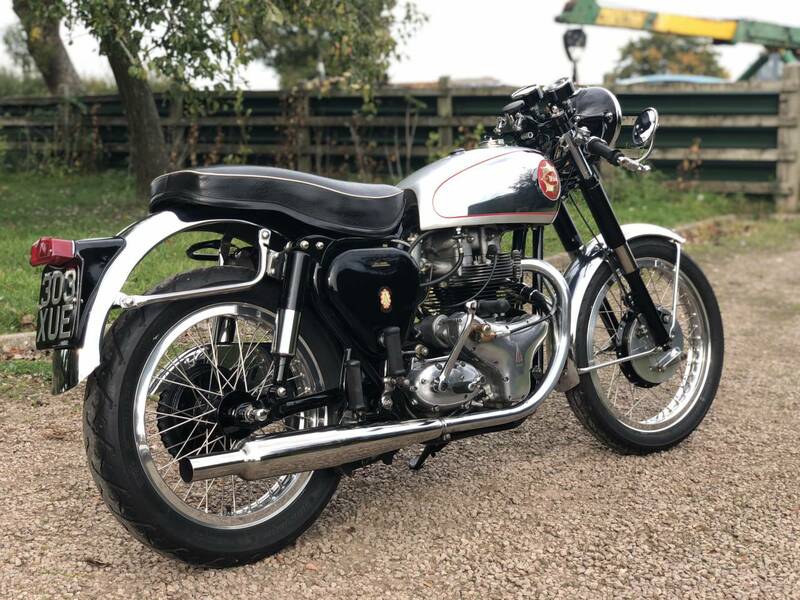 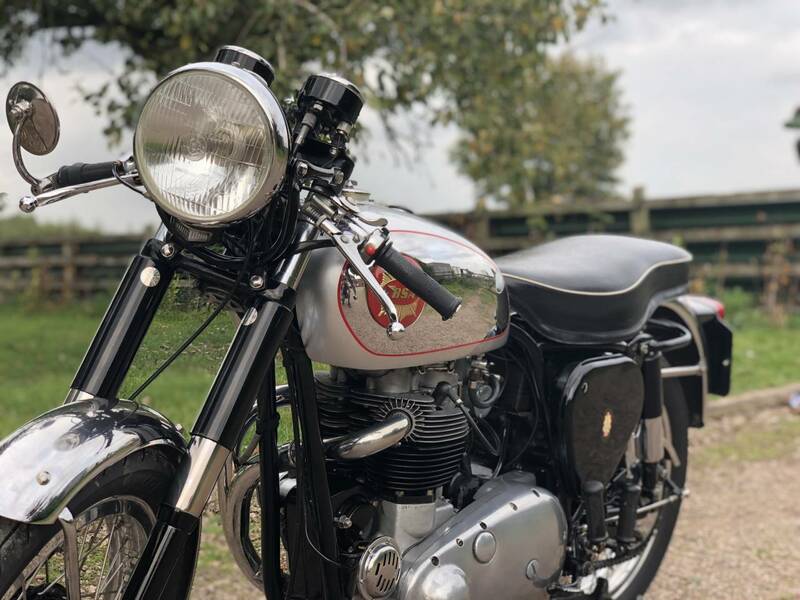 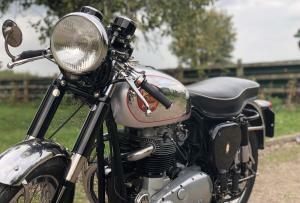 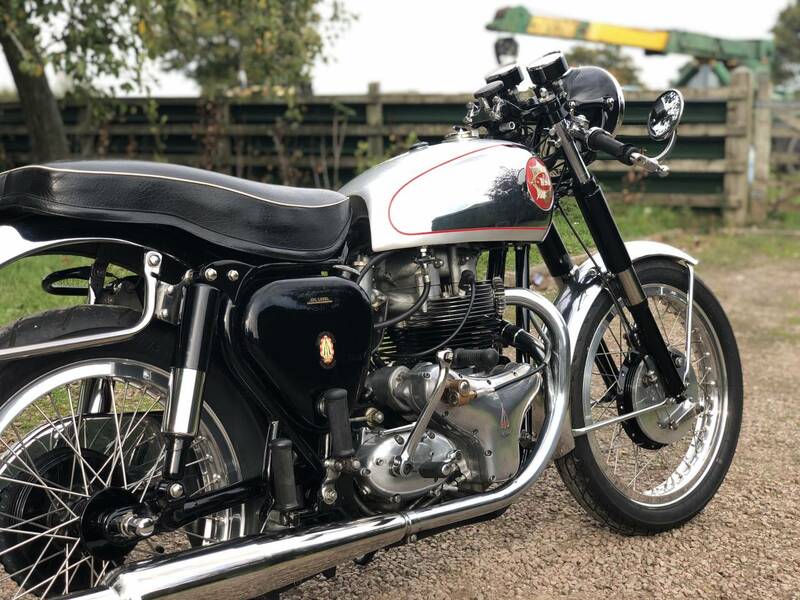 We Rarely Get BSA Twins This Good & This Well Sorted & This Beautiful ! 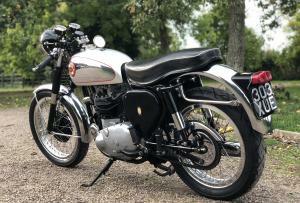 It’s A Real Treat To Look At & To Live With & Own . 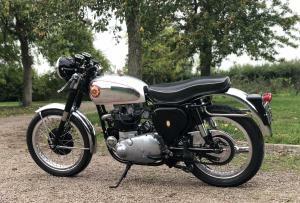 A Real Peach & £10,000 Less Than A Correct Numbers One !